The Coleman Instant tent truly is instant and is an ideal family camping tent. The internal pole system takes about a minute to pitch, staking the tent takes a few minutes more, and then you are done setting up camp and free to enjoy the outdoors. It's easy to be skeptical about the Instant Tent's advertised 60-second set-up, but it is actually very quick and easy to pitch, which makes getting to camp and setting up less stressful. The most time-consuming part is not actually pitching the tent, but staking it down. The Instant Tent comes in three different size ratings to help you select the right size tent for your needs. However, the sizes run a little small; it's suggested to order up to have ample space. The Instant Tent 4 is fairly small and not tall enough to stand in, so even if you don't need more space, it's recommended to get the 6, which allows you to stand up and easily move around. As the tent fabric is fully waterproof with taped seams, a rainfly is not necessary. Mesh windows open up for ventilation. Even though the tent is waterproof, it is not an ideal tent for rainy weather because there is no vestibule. If you plan on camping in rainy weather, you should always bring a tarp for extra weather protection. The best feature and selling point is the instant set-up. It's a pleasant surprise how simple and quick the tent was to pitch, even solo (a perk for intrepid, independent travelers). A quick set-up allows you to easily and frequently move camps on a camping road-trip and/or have more time to relax when you arrive at camp. There are many pros to this tent—mainly ease and convenience. The Coleman Instant tent is very easy to set-up and truly only takes about a minute (as advertised). The internal pole system with attached poles makes set-up quick, easy and thoughtless. The Coleman Instant Tent comes in 3 different sizes: 4, 6 and 8, so you can get the same design and right size for your needs. One large door makes moving in and out of the tent comfortable. However, there are some cons like size and price. The size ratings run a little small, so order up one size to have the space for your family and comfort you desire. The tent is fully taped and waterproof, but there is no vestibule or rainfly. 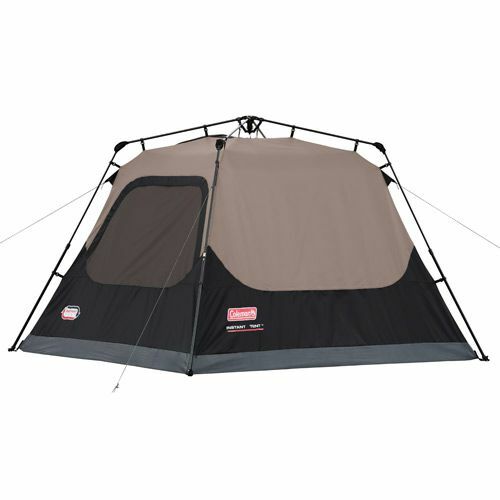 The internal pole system makes this tent bulky to pack and heavy in the bag. It costs a bit more than a basic camping tent (expect to drop between $150 and $200).